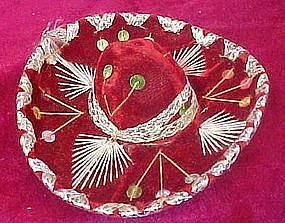 An adorable little vintage sombrero that was probably a souvenir from Mexico. Well made and covered with marroon velvet, sequins, silver braid, and decorative stitching. Does your chihuahua need a new hat? Maybe you need some table props for a south of the border banquet or party? Maybe even a nice doll hat for that little senoir' doll. Nice condition. Braid has one small spot that has been frayed, but can just be tucked back under the stitch. I will be listing more.